Sealogica is a whole food blend of 7 wild-harvested sea vegetables, harvested from the coldest waters from around the world in their region of origin. 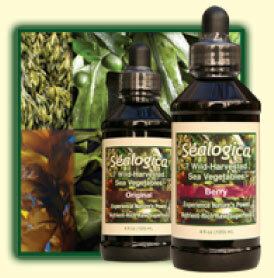 The Sealogica synergistic blend of sea vegetables contains a tremendous variety of vitamins, minerals, trace minerals, and amino acids in nature’s perfect balance — plus antioxidants, flavonoids and many other powerful nutrients found in nature, required for ultimate health. Dr.Carney is recognized as an international weight loss expert. "Sealogica" is my, go to product, because my patients respond so quickly.Sealogica® contains many Vitamins,Minerals,Trace Minerals and Amino Acids known to man for ultimate health". Dr.Johnson is recognized as a world famous breast health specialist and the only medical doctor on the #1 selling DVD world wide "The Secret".DR.Johnson is also the co-author of the best selling health book..The Healing Codes. "The Sea Vegetables in Sealogica" are among the most nutritious foods on the planet".Studies have shown they have anti-flammatory benefits due to the slfated polusaccharides in them. They also help in detoxing, by ridding the bodyof heavy metals and radiation, to bring your body back to ultimate health". Dr.Nelson is recognied by the World Health Organization(WHO)as one of the top 100 naturopathic physicians in the world. Dr. Nelson was Instrumental in helping Suzanne Somers in regaining ultimate health. He is also listed in 2 of Suzane Somers books,Breakthrough,and Knockout. I recommend Sealogica to all my patients.It's the only single product that i have ever found that increases energy,boost metabolism and balances thyroid and sugar levels. These 4 major factors help my patients, attain ultimate health.